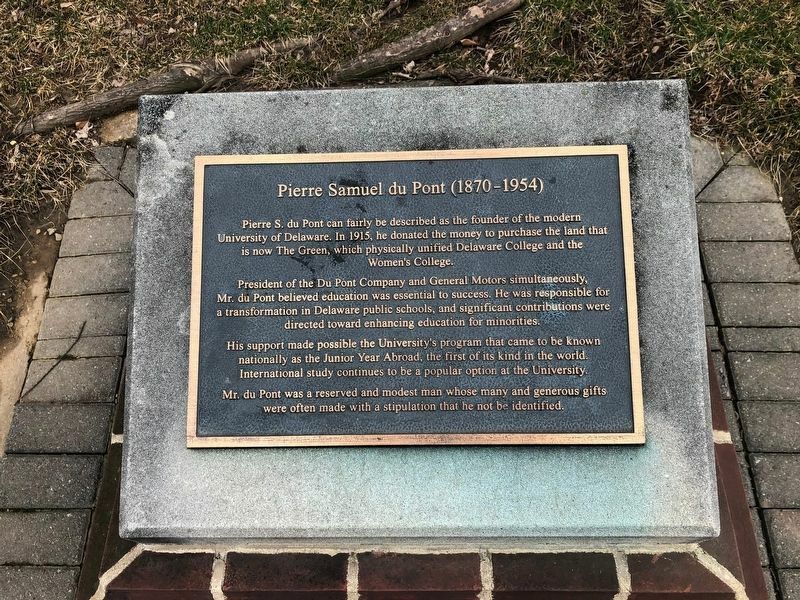 Pierre S. du Pont can fairly be described as the founder of the modern University of Delaware. In 1915, he donated the money to purchase the land that is now The Green, which physically unified Delaware College and Women's College. President of the Du Pont Company and General Motors simultaneously, Mr. du Pont believed education was essential to success. He was responsible for a transformation in Delaware public schools, and significant contributions were directed toward enhancing education for minorities. His support was made possible by the University's program that came to be known nationally as the Junior Year Abroad, the first of its kind in the world. International study continues to be a popular option at the University. Mr. du Pont was a reserved and modest man whose many and generous gifts were often made with a stipulation that he not be identified. is on The Green south of East Delaware Avenue (Delaware Route 273), on the right when traveling north. Touch for map. Marker is at or near this postal address: 127 The Green, Newark DE 19716, United States of America. Touch for directions. Other nearby markers. At least 8 other markers are within walking distance of this marker. University of Delaware (within shouting distance of this marker); George Gillespie Evans (1815-1904) (within shouting distance of this marker); In Memoriam (within shouting distance of this marker); Dr. Walter J. Hullihen (1875-1944) (within shouting distance of this marker); Harry Fletcher Brown (1867-1944) (within shouting distance of this marker); Robert W. Gore, B.ChE., 1959 (within shouting distance of this marker); Samuel Chiles Mitchell (1864-1948) (about 300 feet away, measured in a direct line); a different marker also named In Memoriam (about 300 feet away). Touch for a list and map of all markers in Newark. More. Search the internet for Pierre Samuel du Pont (1870-1954). Credits. This page was last revised on March 15, 2019. This page originally submitted on March 15, 2019, by Devry Becker Jones of Washington, District of Columbia. This page has been viewed 35 times since then. 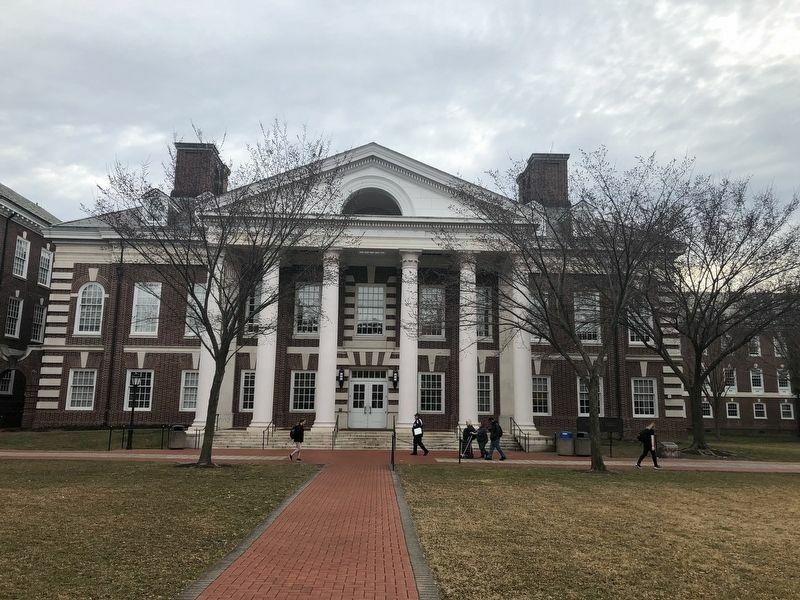 Photos: 1, 2. submitted on March 15, 2019, by Devry Becker Jones of Washington, District of Columbia.